Yes it’s a good thing having 100,000 gathered together under an anti-racist banner (though that was the number throughout the day – I doubt if there was ever anything like that many at any one time), and many people clearly had a good time seeing bands for free. But that doesn’t mean the event should be beyond criticism. It was strange having to be searched and then confined in a fenced of section of the park for an event like this, and inside there was very little atmosphere. The sound on the main stage was really quiet, and the only excitement I saw was in the dance tent where people were whooping to Party People – but the tent was much too small, and as Tilling points out was later closed down. The speeches were for the most part banal and patronising. I know Tony Benn has been semi-beatified now, but it was nonsense for him to say to the mainly young crowd that ‘yours is the first generation with the power to destroy life on earth, as well as the power to create a better world’ (I paraphrase, but this was the sense of it – I heard him give the same speech a few days later in Brixton Academy). Surely his generation of politicians were the first with the power of global destruction thanks to nuclear weapons. I think there were political and musical reasons for this lacklustre display. Politically it was odd to have such a strong focus on commemorating the 30th anniversary of the Rock Against Racism festival in the same location in 1978. It’s one thing to note the historical continuity, another to have a festival to mark the anniversary of another festival – it lent a backward-looking tone to the whole event. Politically too the context is different – the late 1970s festivals took place against the background of mass movements against the racism of the state and the far right, with clashes with police and/or fascists at Notting Hill Carnival, Lewisham and many other places. There’s nothing like this today – the British National Party don’t march and anti-racism is now an official ideology of the state. Nobody seriously believes that there is a danger of a fascist takeover in Britain, however dangerous the BNP could become. It was pretty unlikely in the 1970s too, but there was more of an overlap between the far right and sections of the Conservative Party, along with some senior people in the military and intelligence services. There was overt racism and some sympathy for the National Front amongst many rank and file police officers too. In other words being actively against racism had a radical political charge which it lacks today. To a certain extent the movements of the 1970s and 1980s (not just Rock Against Racism but the self-organised struggles of black people) were successful in banishing overt racism to the political fringe. This doesn’t mean that racism has gone away, but it is a more complex and variegated phenomenon – it’s far easier to project it all on to the BNP than to look at the way different communities are affected by, say, immigration and asylum laws. Given that the Socialist Workers Party was a driving force in both Rock Against Racism in the 1970s and Love Music Hate Racism today, it’s not surprising that a certain nostalgia for 1970s leftism hung over Victoria Park last month and the following week’s LMHR concert in Brixton Academy. For whatever the SWP’s shortcomings in the 70s and 80s, it was for a while a natural stopping off point for many young activists and militants (even if most of them moved on). Recently Mark Steel, its most well-known member, resigned after complaining that that this is no longer the case (shame for those middle-aged trotskyist chicken-hawks who always seemed to be sleazing around their pretty new recruits). Perhaps too the SWP is hoping that LMHR might relaunch their fading brand by associating them with their peak moment. But what about the music? Perhaps it’s just my personal bias but the bands who played for Rock Against Racism in the late 70s – The Clash, X-Ray Spex, The Gang of Four, Steel Pulse- were at the forefront of a period of post-punk creativity that was new, forward-looking and explosive. The biggest band in Victoria Park 2008 by contrast was Hard-Fi, defined like many other current bands by a nostalgia for that period that is musically old, backward-looking and safe. At the Brixton Academy it was different, as one of my favourite bands – the Alabama 3 – played a great set and didn’t sound like they could have been on the stage in 1978. Of course there’s still plenty of exciting music today – but let’s not discuss the fiasco of the Victoria Park dance tent again. Leaving aside the music and politics, the organisers of the LMHR would no doubt say that the event was constrained by council and police health & safety and licensing regulations, and they’re probably right. I have been to a number of similar ‘free’ events in London parks in the past few years, heavily policed, searched, surrounded by high fences, restricted about what drinks can be taken in etc. (the Rise anti-racist festival in Finsbury Park last year was similar). 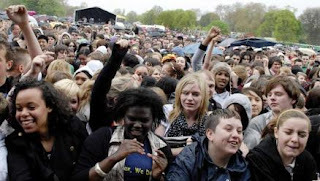 There’s a long history of huge free events in London parks without fences or searches, just music and whoever wants to turn up, spreading out as far as they need to take make themselves comfortable. This goes back at least as far as the famous Hyde Park concerts of the 1960s with The Rolling Stones et al, and through to the Rock Against Racism events in Victoria and Brockwell Park (Brixton) in the 1970s. I was too young for these but remember some of the big events put on by the Greater London Council in the 1980s. In the 1990s the biggest event was probably Lesbian and Gay Pride, held variously on Clapham Common, Brockwell Park and elsewhere – with hundreds of thousands of people coming and going as they pleased. Proper dance tents too with decent (loud) sound systems and holding thousands of people. There were also smaller one day free festivals like the Deptford Urban Free Festival in Fordham Park (30,000 people and lots of sound systems and bands) and the Festival of Global Rights on Hackney Marshes (1998). Some of these were later refused licenses while others have been regulated to a shadow of their former selves. The atmosphere inside a fenced off area is completely different from being unrestrained in the open air in the park – there is a sense of being a controlled audience instead of a free crowd taking temporary possession of a part of the city, of being permitted to spectate rather than exercising a right to assemble. Perhaps that’s why the Victoria Park LMHR event was so lacking in atmosphere – as well as the rain, the politics, and the music. Other reviews: Suburban Ghetto Musick reminds me that I missed Patrick Wolf who is pretty cool; Vinyl Junkie rubs salt in the wound by reminding me of some of the great stuff that was in the dance tent.